This week saw Republicans in the state House of Representatives introduce their own legislation to reduce property taxes. Ironically, the bill uses a mix of increased personal income and sales taxes – the same mix in Gov. Wolf's budget plan Republicans have been criticizing – to allow for a reduction in property taxes. There are big differences between the Republican plan and Gov. Wolf's plan, however. The Republican plan seems designed to direct more property tax relief to school districts in Republican areas of the state instead of to taxpayers and schools that need the relief the most; no surprise there. But the Republican plan also delivers a bigger share of property tax relief to owners of commercial property and vacation homes. The primary goal of property tax reform has always been to help senior citizen and middle-class homestead and farmstead owners – not businesses and vacation property. Gov. Wolf's budget package only allows for property tax relief to these kinds of property once homestead and farmstead owners have received the MAXIMUM amount of property tax reduction permitted under the state constitution. Gov. Wolf's budget also provides relief to thousands of renters – of all ages – to minimize the impact of the increased school funding burden they would bear. The Republican bill does nothing for renters. The Republican bill also does nothing to address the state's $2 billion budget deficit, re-invest in education or make the state's school funding system fairer. It falls well short of the comprehensive plan offered by Gov. Wolf that would not only save homeowners billions, but also improve our schools and invest in our future. WHAT HAVE REPUBLICANS DONE TO WORKERS LATELY? Republicans also took the opportunity this week to once again work against the interests of Pennsylvania's working men and women. Republicans in the state Senate voted to rescind an ordinance Philadelphia had already passed to allow workers in the city to earn paid sick leave, and made it illegal for any other community in Pennsylvania to pass a similar ordinance. Yet, to date, Republicans have refused to join House or Senate Democrats in passing a statewide leave law, or take other steps to help workers, such as increase the minimum wage, strengthen the state's equal pay for equal work law, or protect all Pennsylvanians from job and other discrimination. Gov. Wolf has come out as a strong supporter of all three initiatives. Can early retirement incentives save Pa. money? 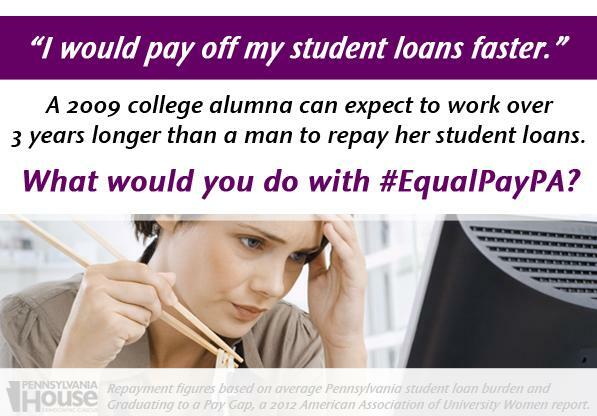 What would women do with #EqualPay?